On the field, no offensive lineman can stop Ed Oliver from imposing his will. Off the field, the Houston star doesn't let any conventional wisdom keep him from going his own way. This story appears in the Aug. 13, 2018, issue of Sports Illustrated. For more great storytelling and in-depth analysis, subscribe to the magazine—and get up to 94% off the cover price. Click here for more. College football’s best player stops talking when he hears them coming. He sets down a forkful of brisket and nods toward a group of teenagers on four-wheelers roaring down the street next to Burns Original BBQ. They’re tearing through Houston’s Acres Homes neighborhood, just like Ed Oliver used to when he was their age. Maybe in the evening, when it isn’t hotter than the blazes of hell, some of them might ride through again—on horseback, as people sometimes do in this neighborhood. As Oliver watches the boys pass, his eyes twinkle. The Houston defensive tackle has seen a vision of his past and, if all goes well, of his future. In the last five high school football recruiting classes, 158 prospects have been given five stars in the 247Sports.com composite rankings. Only one has chosen a school outside the Power 5—the ACC, Big 12, Big Ten, Pac-12 and SEC—the conferences that make the most money, produce the most NFL first-rounders and win all the national titles. That player was Oliver, who could have followed a more obvious path to stardom. Instead, he chose to be a boss in his hometown. Toby Weathersby, an offensive tackle who teamed with Oliver at Westfield High before playing three seasons at LSU and signing with the Eagles as an undrafted free agent, grew up with Ed and his older brother, Marcus—who finished his career as an offensive lineman at Houston after the 2017 season. Weathersby and Ed rode everywhere together. Oliver had dirt bikes and horses. Weathersby had four-wheelers. When the weather was nice, Ed would mount a half standardbred/half Tennessee Walking Horse named Oreo, and Weathersby a massive Tennessee walker named Coffee—sometimes without saddles—and ride down West Montgomery Road to a fried chicken restaurant. Though horses are still common in Acres Homes, heads would turn at the sheer size of the boys on horseback. They would tie up the horses, eat dinner and ride home. Oliver nearly did join Weathersby at LSU. Oliver verbally committed to Houston on May 21, 2015, but he kept his options open. His family wanted him to play with Marcus, but Oliver had no intention of playing for Cougars coach Tony Levine, who was fired after the ’14 season. The hiring of former Ohio State offensive coordinator Herman had convinced Oliver to give Houston a chance, but if Herman didn’t win that first season, Oliver was going to LSU. Weathersby chuckles at the thought of Oliver in purple and gold, wrecking SEC offenses. “I would have stayed for my senior year just to be able to run LSU,” Weathersby says. “We would have taken it over.” But in Herman’s first season, the Cougars won the American Athletic Conference and beat Florida State in the Peach Bowl. That convinced Oliver. In Oliver’s first college game, against Oklahoma—a school that had offered him a scholarship before he'd even played a varsity game at Westfield—he sacked Sooners QB Baker Mayfield twice in Houston’s 33–23 win. Later that season Louisville and its eventual Heisman winner, Lamar Jackson, visited Houston. Oliver sacked Jackson twice and had another tackle for loss, and his penetration freaked Jackson out so much that for most of the game, the normally elusive QB froze as he tried to spot Oliver. 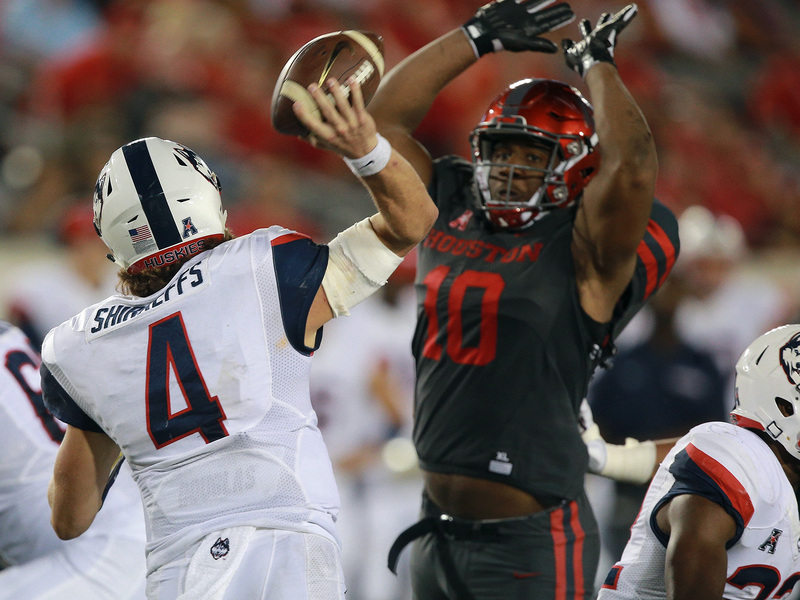 The Cougars piled up 11 sacks, and Oliver batted down three passes. Oliver rattles quarterbacks. During a conversation about the fearlessness of 5'11", 185-pound UCF quarterback McKenzie Milton, Oliver taps on his phone. After about a minute, he flips the phone around to reveal a photo of himself chasing Milton out-of-bounds when the teams met in 2016. “That guy ain’t scared? Tell me that dude ain’t scared,” Oliver says. Upon closer inspection, McKenzie does not appear scared; he looks terrified. This might sound boastful, but coming from Oliver, it’s just matter-of-fact. “His strength and explosiveness and speed?” Herman says. “A human that big is not supposed to be able to do that.” This is why A.J. Blum, who was Oliver’s defensive coordinator at Westfield and is now the defensive line coach at Houston, stopped trying to correct Oliver’s stance. Blum expects his other interior linemen to put more weight on their down hands so they stay low as they fire out of their stances. Oliver can keep his back flat and his weight back but still fire out lower than the players trying to block him. Blum learned a long time ago to let Oliver be Oliver. When Oliver was a high school freshman, Westfield alum and Texas defensive tackle Desmond Jackson visited the school. Blum asked Oliver to introduce himself to Jackson. “My name’s Ed Oliver,” Blum remembers the freshman saying. “I’m the guy who’s going to make everyone forget about you.” Jackson, taken aback at first, eventually got along with Oliver. Like everyone else, he learned Oliver isn’t so much bragging as simply speaking the truth. Of course, Oliver doesn’t appreciate when others don’t see the truth the way he does. He did a photo shoot for the season preview issue of Dave Campbell’s Texas Football, and as the best player in the state, he figured he’d land on the main cover. For a Texan, this is akin to gracing the cover of the Bible. When the issue hit shelves, there on the cover was new Texas A&M coach Jimbo Fisher, who won the 2013 national title at Florida State and came to the Aggies after agreeing to a 10-year, $75 million deal. To Oliver, Fisher is 0–0 in the state of Texas. “He didn‘t do nothin’ but get paid a whole bunch of money,” says Oliver.